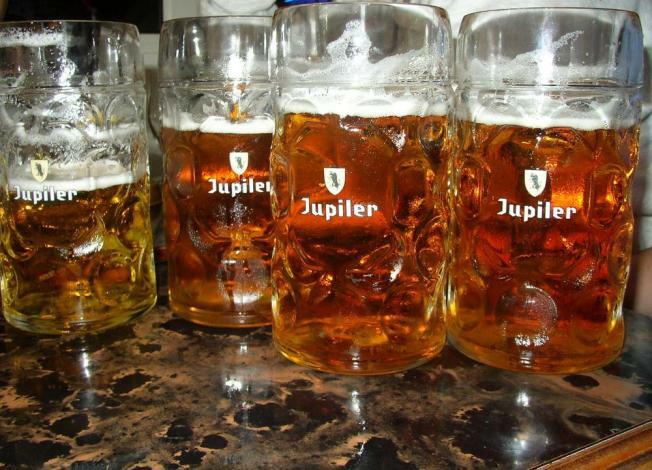 Belgian beers frequently top the "best beers" lists, repeatedly beating out their English and American counterparts. Wondering where you can grab a Rochefort or Duvel? For those of you who love a good Belgian brew, these following restaurants and bars offer decent selections and good atmospheres for enjoying everything from a Trappist to a Lambic. Confused by the names? Even newcomers to Belgian brews are sure to find at least one they enjoy. Prost! One of Imbibe magazines top 100 places to drink in America, this gastropub boasts one of the largest selections of Belgian beers in the mid-Atlantic. Granville's has an all Belgian beer list, and carries over 60 by bottle. While their specials aren't exactly huge money savers, Thursdays feature $1 off Chimay, and Mondays are $1 off all drafts. They don't take reservations, so you can pretty much be guaranteed a wait, unless you come at odd hours. 1238 H St. NE, Washington, D.C.
Brasserie Beck isn't the place to go for a cheap beer and a bite. It is, however, the place to go when you want to get a Belgian beer you can't find anywhere else in America. Beck carries beers exclusive to the restaurant, and they take their beers seriously. They only serve Belgian beers, and their beer sommelier spends an inordinate amount of time on his selection. Beck's beer menu includes descriptions, so those less knowledgeable can make semi-educated choices, instead of blindly picking based on name alone. They carry a lengthy list of Belgian beers, and tend to avoid the stocking problems of Brickskellers. For anyone who's not a fan of the Belgians, they also serve English and German style beers, fruit beers and seasonals. The beers can be pricey, so the Tuesday and Wednesday happy hour, from 5 - 7 p.m., is a godsend. All of their draft beers are 1/2 priced. They also have good deals with their beer flights, but you can't be guaranteed you'll be drinking Belgian. 3282 M St. NW, Washington, D.C. Although it may be better known for its brunch, Belga Cafe also has a decent selection of beers. Weekly specials are geared toward the beers on drafts, which usually tend to be their own brews, but they also carry plenty of Belgian bottles. They also have pricier "special" beers on the menu. One of the ways they differ from other Belgian beer spots is that they offer gluten-free and all natural beer, as well as American made Belgian-style beer. 514 8th St. SE, Washington, D.C.
With no TVs and a no standing rule, The Saloon is very specific about drawing in a certain kind of clientele. However, if you can get passed the rules and realize their genius in deterring a certain kind of crowd, The Saloon is an unpretentious place to sip a Belgian beer or two. Most of the bottles they stock are Belgian, and they serve them in their proper glasses. 1205 U St. NW, Washington, D.C.
No beer list would be complete without mentioning Brickskeller. While stock and service are recurring issues, they do have an overwhelming selection of beers, with a long list of Belgians. Their beer menu is organized by country of origin at the restaurant, and alphabetically on-line. Sister bar RFD has a substantive selection of drafts that change monthly, which you can sample or order by the glass. They boast Washington's largest draft list. 1523 22nd St. NW, Washington, D.C.
810 7th St. NW, Washington, D.C. Forget the crepes. Find your way to a cramped table for 1/2 price Belgian Tuesdays, 4:30-7:30 p.m. The list may be small, but the price cut makes the visit worth it for anyone looking to sample some Belgian brew on the cheap. 2000 18th St. NW, Washington, D.C.